The Six of Pentacles in a Tarot reading is a good sign for success where a good heart is put into action, its also about helping others and being very generous with gifts to share their prosperity. In the reversed position it can be about simple passion, desire and lust and love maybe an illusion. Presents, gifts, gratification another account says attention, vigilance now is the accepted time, present prosperity, etc. Desire, cupidity, envy, jealousy, illusion. The present must not be relied on. A check on the Querent’s ambition. 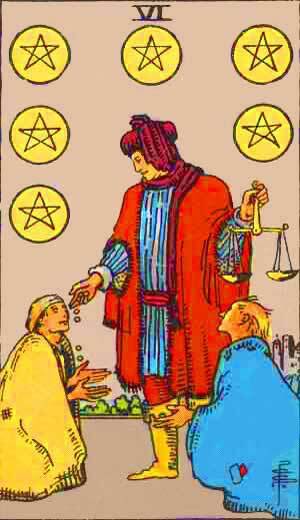 Six of Pentacles – Presents, Gifts, Gratification. Ambition, Desire, Passion, Aim, Longing. The present, the actual moment, to-day; a witness, contemporary, attention, good care, vigilance. Presents, gifts, gratifications, prosperity. Reversed it is said to denote: Cupidity, jealousy, desire, passion, lust and researches. The Fire of the heart on the house of Capricorn, the Tenth, which is the house of the act, the deed, actuality, position and name, superiors and authorities. Moreover it denotes the actual time in the horoscope. The descriptions given by tradition are consequently correct and to the point. We may add, that here, in this combination, the heart’s desire and wish, the impulses to speculate and to create, to make love and to do good, all become active and acute. So this must be a card of practical things, which for the greater part will be of a benefic nature. Good action, which may include the fulfilment of duty as well as giving presents and alms. It means putting the heart into your action, working, acting, doing with much pleasure, conviction and self-confidence. This makes success almost certain. It means good-will and noble intention proved by gracious, charitable or useful action. The symbol of Sol on the cube alludes to the attribution of the Sphere of the Sun to the Divine Number 6. Second decanate of Taurus, under the rulership of Mercury, from April 30th to May 9th. Practicality and determination; discretion and diplomacy; gain by letters, writing, speaking, travel, teaching, commissions, and through advertising, study, books, and all things ruled by Mercury. Loss through the same things. More information on the Six of Pentacles Tarot card. This entry was posted in Tarot, Runes and Divination and tagged capricorn, feelings, heart, horoscope, jealousy, love, money, passion, prosperity, six of pentacles. Bookmark the permalink.